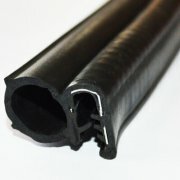 rubber extrusion is made of a EPDM solid “U”channel and a EPDM sponge rubber bulb with the special steel sheet or steel wire clips and gripping tongue to provide a better gripping, rubber extrusion is mainly applied in automotive,machinery,doors and so on. EPDM / TPE / TPV / PVC / NR / NBR / Neoprene / Silicone, etc. Rail cars, Auto, Train, Subway, Steamship, Container, Freezer, Car, etc.